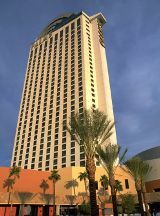 Located on Flamingo Road just West of I-15 and the Las Vegas Strip, The Palms is minutes from the Forum Shops Fashion Show Mall and the Convention Center. Complimentary shuttle service is available to the Forum Shops and Fashion Show Mall. Built from a vision of a place with no limits, no pretenses, and no themes, The Palms was inspired by a quest for the absolute best in entertainment, restaurants, clubs, and spas. 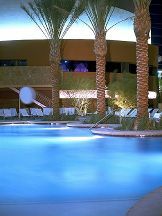 The Palms has more than something for everyone. It is a fusion of imagination and reality that awakens and satisfies your every desire. At The Palms dreaming is believing. It started with an idea. Search the world for the rare and remarkable places that redefine dining and then bring them together in one place. Little Buddha Cafe: Unique Asian Cafe with a fresh sushi bar and an eclectic atmosphere. Garduno's: Serving authentic New Mexican specialities that are world famous for their unique and distinct flavor. Alize: Gourmet French that excites the taste buds and breathtaking views that will bring you back. N9NE: The Nine Steakhouse boasts prime aged steaks and imported spirits that mark Chicago's most popular night spot. Enjoy the finest steakhouse and seafood specialities complete with an exclusive champagne & caviar bar. Sunrise Cafe: A 24 hour cafe with a relaxing casual atmosphere and delicious specialities anytime. Festival Market Buffet: An all-you-can-eat extravaganza offering tastes from around the world. Blue Agave: Enjoy a feast of freshly shucked oysters and seafood cocktails while experiencing an authentic chili bar featuring Mexican, Southwestern and Latin American favorites.